That's why I no longer make much effort. My daughter went as Funnybones for her book day (just wore our skeleton costume from halloween) Most of the girls in her class were in fairy costumes!? At our school it is very P.C so no prizes or awards, which I must say does take the pressure off. As you say, surely the most important thing is to encourage the kids to enjoy books, not stress ut the parents! As an aside, my son was like Sonny and insisted on wearing his Scooby-doo outfit! Not a litery classic exactly is it? Oh yes the world of competitive parenting. I know it well. It was difficult not to get sucked in. Only last week my boy, also called Sonny (what a cool name)had a greek day. I am afraid I got all riled up and after seeing Percy Jackson Sonny decided he wanted to go as Hermes. He had wings on his gladiator sandals, a brilliant hat, the works. I felt sure he was in with a chance of the prize. No! Went to a girl who was wearing a Sari thing - same thing she wears for every event - Roman, Victorian, World Book Day etc. Bitter? Me? Last year we went all out (not for competitive spirit, but as we've been so slack in recent years we felt we owed it to the boys). Our 10 yr old minotaur was AWESOME and didn't win (a shop-bought one did.. mutter mutter). Our 7yr old zebra crossing was simple, genius and definitely deserved its win ;) The youngest 6yr old penguin stripped his costume by morning break and really shouldn't have been allowed to even enter. Hmm, I agree, it shouldn't be about the winning really should it? We had our Key Stage 1 and 2 party yesterday Heroes and Heroines theme; 5yo was cool going as a skelly-bob (yep, I know, Hero??) and 7yo told me in the morning, he wanted to be a vampire (yep, another traditional Hero!) - he was more than happy with some facepaint fangs and an old black skirt of mine safety-pinned around his neck for a cape - cool! Took 10mins, and he looked better than all the shop-bought padded costumes! I am the worlds worst mum at dress up events and because I refuse to enter into playground mafia politics of my outfits better than yours, my kids are always the worst dressed, but the kids are used to it. Last term my daughters class had to dress up for ramadan and the teacher told her the homemade sari we put together was not good enough and that she should put more effort into it! Being Gaby she turned round to the teacher and said "that if she had a problem about the outfit to take it up with her mum, because her mum says dressing up outfits for school are not what is important or what she will earn her grades from!" Needless to say the teacher did not bring the subject up with me! Funnily enough I posted about this topic on Thursday because I too know from first hand experience the competitiveness that breaks out in the playground in the run-up to World Book Day! I think you're right - the important thing is that the message of WHY we have World Book Day doesn't get lost in all the pressure of the fancy dress parade. I don't think there's anything wrong with celebrating favourite characters from books because it does at least highlight one of the reasons why children read, but I do think the competitiveness is nuts. Oh dear, I'm with Juicy Tots...I don't really make an effort any more. There are only so many years you can take the competitiveness..I've had enough, it's all too stressful plus a complete an utter pain. I literally feel my shoulders droop whenever I hear of these days. I'm such a bad parent!!! This is very very very funny. Mainly because I am still in the pre-world book days years. Maybe I should start sewing/bribing the headmistress NOW! I love the Dr Who outfit, what a dude! My mum used to spend hours making costumes for our primary school events - as soon as we arrived I used to strip to my birthday suit and run around the playground - hope the bear doesn't inherit the trait! Thankfully our kids' school usually only want money. The dressing up is a fairly half-hearted affair 'slippers on tuesday' 'silly hat day' 'shirt on backwards day'. I realise that we've had a merciful escape. 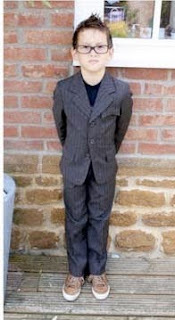 I think WBD is a great idea - forcing parents to dress up children less so. Another great post - I'm sat laughing to myself (that in a minute lie is getting bigger!). I'm thankful to our very lazy head for ignoring world book day. My no.3 had to take his favourite book to nursery - completely forgot but thankfully he had a paddy in the morning and so I let him take charlie and lola as a bribe - serendipity! The next level of hell - decorating easter eggs/bonets! The pressure is awful isn't it! It's my son's first year at school so I am just getting used to all these things. I have managed to scrape together a pirate outfit out of some bits we already had, just hope it holds up to the scrutiny!